ePosters - Automated Structure Verification: What are the Right Experiments and Processing? 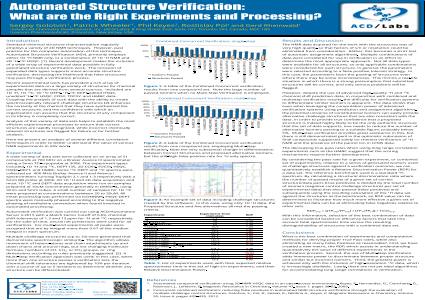 Poster Title: Automated Structure Verification: What are the Right Experiments and Processing? Abstract: Standard chemical structure characterization regularly employs a variety of 2D NMR techniques. However, past practice for the computer automation of this technique, Automated Structure Verification (ASV), primarily employs either 1D 1H NMR only, or a combination of 1D 1H NMR and 2D 1H-13C HSQC. Recent development makes the inclusion of a wide array of experimental data possible in fully automated structure verification work. The inclusion of expanded data types supports more accurate structure verification, decreasing the likelihood that false structures may pass through a verification process. Recent experimental work has provided a rich array of experimental data on a large variety of structures for chemical samples that are derived from several sources. Included are 1D 1H, 1D 13C, 1D 13C DEPT, 1H-13C DEPT-edited HSQC, unedited 1H-13C HSQC, COSY, TOCSY, and HMBC data. Coupling the analysis of such data with the ability to create spectroscopically relevant challenge structures enhances the certainty of the chemist that they have synthesized the correct structure, and the confidence with which an organization can assume that the structure of any component in its library is completely correct.Summary: This poster presents an analysis of several different correlation techniques in order to better understand the value of various NMR experiments in ASV work.References: 1. Automated compound verification using 2D-NMR HSQC data in an open-access environment, Keyes, P., Hernandez, G., Cianchetta, G., Robinson, J., Lefebvre, B. Magnetic Resonance in Chemistry, Volume 47, Issue 1, pages 38-52, 2009.